MECHELEN - Since its foundation in 1922 the Royal Carillon School 'Jef Denyn' in Mechelen (Belgium) has been involved in the support and development of the art of carillon playing. As part of this effort, the school organises the 'International Queen Fabiola Carillon Contest' in cooperation with the city of Mechelen. This contest, widely recognised as the most prestigious of its kind, provides a powerful stimulus for the recognition of carillon playing as an artistic expression of the highest level. The winners of the former contests have acquired international fame: 1987 - Geert D'hollander, 1990 - Boudewijn Zwart, 1993 - Gideon Bodden, 1998 - Tom Van Peer, 2003 - Twan Bearda, 2008 - Kenneth Theunissen, 2014 - Joey Brink. 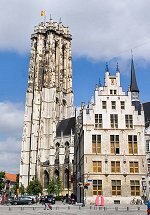 From July 10 till July 14, 2019, unique sounds of the carillon will be heard again throughout the inner city of Mechelen during the eight International Carillon Competition Queen Fabiola. This musical competition is held every five years. The Royal Carillon School Jef Denyn and the Association for Tower and Carillon will bring together the best carillonneurs in the world. The pre-selections will be held on Wednesday July 10 and Thursday July 11. From these candidates, an international jury will choose the five finalists. A new element is introduced: all candidates of the pre-selections can take part in an improvisation competition if they wish to do so. On Saturday July 13 the finalists will play on the carillon of the Saint Rombolds tower. The highlight of the competition will be the second day of the finals on Sunday July 14 in the Cultural Center, where the carillonneurs will not only perform solo on the chamber carillon, but will also perform together with a brass ensemble. Applicants can register for the competition until May 1st, 2019. More detailed information about, for example, the jury, the mandatory pieces and the program to perform can be found on the website of the Royal Carillon School.